“No Results: 12 Billion Dollars Disappeared in Palestine”. This headline popped recently to my eyes. First I was thinking that it is Zionist propaganda or comment in some hard-line Israel newspaper. Then I saw that headline was based to a learned discourse of Dr. Ghania Malhis – chairwoman of the board of trustees at The Palestine Economic Policy Research Institute (MAS) and former senior economist in the League of Arab States. MAS was founded in Jerusalem in 1994 as an independent non-profit institution to contribute to the policy-making process by conducting economic and social policy research. Presentation of Dr. Malhis was held in UN Seminar on Assistance to the Palestinian People on 25 March 2010 in Vienna. “the GDP of 2009 is 13% lower than the GDP of 1999, and the GDP per capita is 30% lower for the same years”. Her original study “International Assistance in Support of the Palestinian Economy: The Role of Regional Partners” can be found here as pdf file and it has been my main source for this article. The international assistance to the Palestinian people has an accelerated annual growth rate. The average annual contribution from 1994-2000 represented 500 million dollars and jumped to an average of 1 billion dollars a year from 2001-2005. Although 2006 witnessed a slight decrease registering 716 million dollars, the numbers rapidly escalated to 1.5 billion dollars in 2007, 1.7 billion in 2008, 1.8 billion in 2009 and is expected to reach almost 2 billion dollars in 2010.
the International community and Arab countries have managed to mobilize substantial resources to assist the Palestinian people amounting to no less than 12 billion dollars over the past 15 years. An additional 6 to 8 billion dollars were also mobilized during that same period through an array of active Arab and international civil society organizations and NGOs. These numbers are also exclusive of the assistance provided through popular national campaigns from the Arab region, NGOs and other informal channels. These are estimated to have exceeded 5 billion dollars over the past decade mostly in the form of relief campaigns and food and cash donations. These numbers neither include the contributions provided by Arab governments to the UNRWA budget where the bulk of its expenditures are used to support its activities in the occupied Palestinian territories, nor the expenses associated with hosting more than 4 million Palestinian refugees in Jordan, Lebanon, Syria and Egypt. These numbers are of course highly encouraging when taking into consideration the size of the targeted part of the Palestinian people which do not exceed 3.9 million people in the occupied Palestinian territories and their GDP does not exceed 4.5 billion dollars annually according to the 2009 estimates. It has been almost impossible to trace any positive impact of these mobilized resources on the ground, even when taking into consideration the substantial investment carried by the Palestinian private sector in the occupied Palestinian territories, including those made by the Palestinian Diaspora as according to findings, these investment represent one third of the national GDP. And despite donors’ generous assistance and contribution, we witnessed an incessant increase in the need for the Palestinian Authority to borrow from local banks to meet its obligations whereas the accumulated public debts of the Palestinian Authority to the local banking system has exceeded 733 million dollars in mid 2009 with accumulated arrears payments to the private sector of 188 million dollars; and therefore affecting the private sector’s ability to mobilize financial resources. – In 2009, the GDP is 13% lower than that of 1999 and the GDP per Capita 30% lower for that same year. – The production capacity in the occupied territories was higher in the early nineties prior to the peace process, and the registered contribution of the agricultural and industrial sectors to the GDP did not exceed a mere 18.2% and only contributed to 29.2% of employment. – The exports coverage to imports became a feeble 19%. – The ability of Domestic Production to cover domestic national consumption has highly deteriorated resulting in an increase in dependency on Israeli imports and a heavy reliance on Arab and international aid to finance the cost of these imports. – We have also witnessed a decrease in the Palestinian authority revenue stream resulting in its turn in an evident deterioration in its ability to provide basic services such as health, education, social development and security unless heavily subsidized by Arab and international donations and aid to support its expenditures. – In 2009, international support was required to address a budget deficit of 61.4% equivalent to 39% of the Palestinian GDP. Whatever progress there has been in the establishment of Palestinian Authority institutions, along with security, fiscal and administrative reform efforts, the bottom line is that these tens of billions of dollars spent in the past decade have ultimately failed to bring back the performance witnessed in 1999 on the socio-economic front. These numbers and facts are giving us a clear indication that these practices and contributions have failed to capitalize on the resources mobilized, quite the contrary; one cannot but feel that these resources have been wasted. When the outcome of more than a 12 billion dollar investment results in such disastrous numbers, then it is obvious that immense mistakes were made on a strategic level. Looking back, the mistakes done were not the responsibility of a sole partner, rather it has been the result of collective failures of all stakeholders from the Arab countries, to the International donor countries and institutions to the Palestinian Authority and Israel as well as the cumulative effect of an assistance that became donor and even charity driven rather than investment driven. The Arab countries have also deviated from their decisions taken in the October 2000 Arab Emergency Summit in Cairo where it was clearly stated that emergency relief to the Palestinian people has to be coupled with developmental aid, and that 80% of the Arab funds mobilized should be channelled into investments to enhance the capacity of the Palestinian Authority and supporting it in creating a viable independent economy, more integrated with Arab, Regional and international economies in order to reduce its heavy reliance on lessen the smothering imposition of Israel. The approach taken was a reactive one, where donors’ countries responded to crisis after crisis rather than work on an active engaged plan to build a stable environment and therefore avoid and pre-empt crises. Thus resources were wasted in trying to compensate and respond to the urgent needs of the Palestinian losses as a result of the aggressive Israeli policies and practices such as closures, embargo, confiscation of agricultural land and, control of water resources, demolition and destruction of agricultural produce, industrial plants and services, public and private properties, impediments to trade and crippling the movement of goods and people. The cost of such practices overshadowing all resources mobilized by donors therefore resulting in an always negative impact no matter the size of the investment. While International donors had only slight idea what they want to achieve with their donations and even worse strategy how to implement foggy visions in beneficiary region it’s clear that the Palestinian Authority also hold a sizeable responsibility. They failed to invest the funds mobilized by Arab and International donors on development, they used Aid to cover their current running expenditures and filling their own pockets instead of sustainable development.Hundreds of millions were invested by the PLO though private investments in businesses, restaurants, supermarkets in the US with no records kept with tens of millions lost for ever. With no one bothering to protect public funds, one has to wonder how many hundreds of millions people and individuals within the PLO and Fatah were able to make out of having monopolies for distributions of fuel, food, and other monopolies granted by Arafat and the PLO. The Palestinian Authority failed to provide developmental sustainable solutions to unemployment, choosing governmental recruitment over encouraging and nurturing a vibrant productive economy to create jobs. They have also chosen to take the easy way to improve public revenues by financing the budget deficit through increasing the trade balance deficit, as well as competing with the private sector through public investments in vibrant sectors of the economy rather than invest in infrastructure to enable the private sector to flourish. The Palestinian Authority has also failed to timely address allegations of misuse of funds, power and mismanagement as well as a lack of accountability and transparency in addition to fostering a large public sector that exceeds the national needs. Our efforts need to multiply and result in well-studied strategies for development that will reflect our sincerity and commitment to the Palestinian people. These efforts need to be translated into massive reforms and visionary partnerships between donors, the Palestinian Authority and key sectors of Palestinian society, which would signify a paradigm shift in developmental strategies, a main component of which needs to be a capable and innovative workforce. And the working model that can most effectively translate such strategies into positive realities is one that proposes to bring together prudent Arab, International public and private actors, progressive coordinated policies, a responsible private sector and an engaged civil society, whose purpose is to create a highly skilled, dynamic workforce that will push the Palestinians towards sustainable and balanced development. We need to work together to create the much needed infrastructure for a flourishing Palestinian economy, one that nurtures creativity and innovation, a productive knowledge economy that will allow the Palestinian people to build a life and not just an existence. I do not believe that the case of Palestine is unique with development projects by big donors. In my earlier articles I have described some similar aspects and critical examples. More e.g. From my viewpoint the first task for donors should be to put Aid programs into general context. Today seems that donors framework is fixed only to two-state solution. So Aid is going to state-building activities e.g. to construct some infrastructure in Gaza. When some building is ready and Hamas use that facility for their activities, Israel Defence Forces destroy it, then donors build it again and IDF destroys it – again and again the same vicious circle. In my earlier articles I have proposed other alternatives e.g. population transfer to get some buffer zone between IDF and Hamas (more in “Gaza War: Could Balkan history show way out?” ) or changing two-state solution to three-state option (more in “The Three-State Option could solve Gaza conflict” ). Putting other options on the table could give totally different vision to international Aid and maybe some positive outcome to beneficiaries too. * Internal investigations should be supported not prevented by donor management. There is also question if aid money should be channelled through beneficiary government or through civil society/NGOs. My answer is complicated. 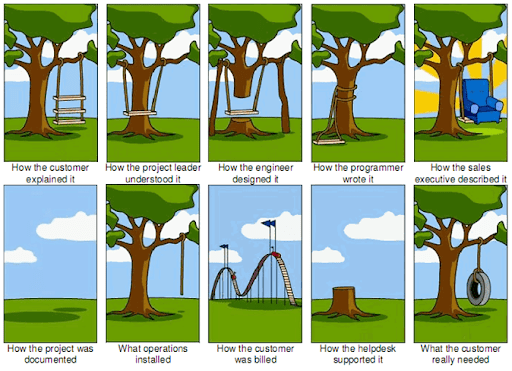 First there is difference if we speak about emergency aid or more long term state building projects. In emergency case I think that effective actions can be made even without state authorities, directly on the field, in second case results are very difficult to achieve without government commitment. Speaking development projects on the ground – not on emergency stage – there are many alternatives depending individual cases. Easiest for donors is to give aid through generalized budget support – results can vary from state to state and be like in Palestine, nonexistent. Through sector program assistance is the other option. Then it is possible contract international or national NGOs for implementation or give aid through multilateral mechanisms such as World Bank, UN programs etc. The core question too is to find in each case right balance between aid through government or aid through civil society organizations. In challenging and fast transforming environment there might be wise to use some improved LogFrame method such as the Appreciative Inquiry tool developed by SIDA, where the focus is placed on the things which are working well, and on finding positive action alternatives for resolving a situation. As LFA is found by many to be an overly problem-oriented model the Appreciative Inquiry tool is analysing also motivation and driving forces. Also useful might be further developed Social Framework, rather than a Logical Framework, because it emphasises people and their relationships, rather than more abstract events and processes. But like I wrote earlier even the best project plans and their implementation can fail, unless they are coupled with a political solution with realistic vision about future. There seems to be a huge gap between fine ideas/plans/collected money in Brussels and their reasonable distribution at local level in Palestine. The biggest mismanagement or misuse of Aid money is not according my opinion local criminal activities. The strategic error has made in international level by not knowing the demands or challenges on the ground, not adjusting ideas and plans according local needs or the moment of Aid delivery, using indefinite mixture of emergency relief and long term planning, lack of simple and unambiguous development strategy and strategic leadership. The real crime will be if international community does not correct earlier errors and practices at strategic level – only after that one can demand smoothly flowing project at local level. The strategic error is to use Aid funds only in a right way, not to right purposes. 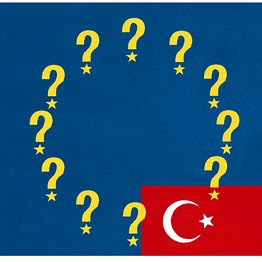 Turkey’s EU hopes -is there any? While Turkey is rising regional Eurasian superpower is EU-Turkey relationship still foggy. From my viewpoint it looks like EU has two strategies – outside official diplomatic statements – for future process with Turkey: Either EU is waiting that Turkey never will comply the membership criteria or it is innovating new obstacles to guarantee this. As Turkey is extremely important economical partner for EU as well rising EU’s energy hub there is a third way offered to Turkey – a “privileged partnership”. Turkey submitted its application for associate membership in the European Economic Community in 1959. That was 51 years ago. seeking membership of the EU since 1987. Now Turkey, after three decades of petitioning to join Europe, is an official candidate for membership in the European Union. 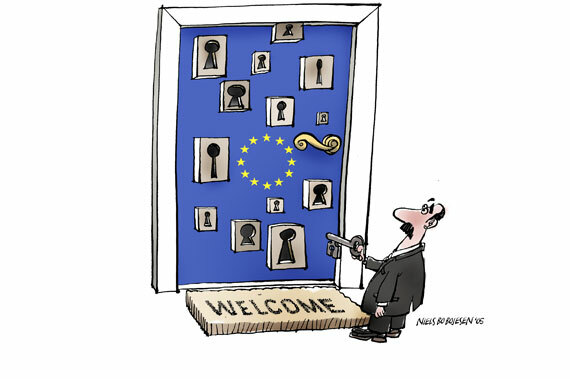 Joining the E.U. requires meeting “European standards” for institutions that address a wide variety of legal, social, economic, and political issues. These include judicial and economic structure, the abolition of the death penalty, free speech and a free press, minority rights, and curbing military power. Since the EU symbolically opened membership talks in 2005, Turkey has provisionally solved only one (research and development) of 35 issues of concern to the E.U., and only begun to address 11 other policy chapters that candidates must complete. From these 11 eight remain blocked over Turkey’s failure to carry out the Ankara Protocol, which was signed in 2005 and states that Turkish ports should be opened to products from the European Union, including Greek Cypriot goods. There is many obstacles on Turkey’s road to EU accession like missing trade links with Cyprus, like Turkey’s refusal to open its ports and airspace to EU member Cyprus freedom of expression, like the rights of the Kurdish minority and need for Turkey to speed up its political reforms. However its is easy see that these issues are only useful cover to real unspoken fact that France and Germany, among others, don’t want Turkey to join EU. In France some polls are showing over 80 % of population to be against Turkey’s membership. Nicholas Sarkozy, the French president, has already moved to torpedo Turkish accession to the bloc by stopping ratification efforts in five key areas. 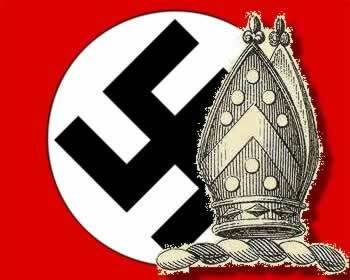 In Germany Angela Merkel’s Christian Democrats (CDU) and the Free Democrats (FDP) are both hostile to the accession. The CDU is against the Turks joining for cultural reasons while the FDP has said the country’s economy is too far below European standards to integrate comfortably with other members. 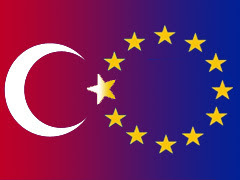 Turkey – a country of 72 million – would be second only to Germany in scale if it were to join the EU. Although the government of the country is secular, estimates put the proportion of the population which is Muslim at around 99 percent. On other words it is Turkey’s overwhelming embrace of Islam which is the real issue against country’s EU membership. German Chancellor Angela Merkel insisted on “privileged partnership” for Turkey instead of full EU membership before her visit there March 29-30. “I am of the opinion that we should rather aim for a privileged partnership, in other words a very close affiliation of Turkey to the European Union,” the chancellor said in a radio interview. Privileged partnership, which falls short of full membership. Both Berlin and Paris have peddled the term as an alternative to Turkey’s full membership of the EU, something which they vigorously oppose. She told a Turkish newspaper that Ankara should instead be granted a “privileged partnership” with the EU, a unique status that has not been conferred on any other country that has negotiated its way to membership. She added that Turkey could apply some 80% of EU law. Together with Spain, we run the United Nations Alliance of Civilizations initiative against extremism, which benefits Europe. We have been a member of the customs union since 1996, and we satisfy the political criteria established in Copenhagen. In fact, we are even closer to fulfilling the economic Maastricht criteria than some E.U. member states. And then there is the fact that we are a founding member of the Organization for Economic Cooperation and Development (OECD) and have been a member of NATO since 1952. This makes us a bridge between the West and 1.4 billion Muslims. According to the Merkel government, Turkey will never be able to fulfill the criteria necessary to join the union; and even if it does, the EU members will not approve this membership. However, Germany also estimates that Turkey will become an unstable country if the process is simply abandoned. So Germany proposes implementing a “privileged partnership” to Turkey instead of full membership in order to allow Turkey into the EU economically but not politically. This proposal is perhaps reasonable for them; however, it is not rational from Turkey’s perspective. Turkey has no intention to build ties with the EU other than membership. If the membership process fails, Turkey can pursue its bilateral relations with some EU countries, concluding trade or investment agreements with them or initiating cooperation on security and defense matters, but no one can guarantee that Germany will be one of the countries Turkey will choose to develop its relations with. Furthermore, if Turkey does not become an EU member, it will no longer have the obligation to realize the “free trade area +” project, called privileged partnership, with the EU. We already have the customs union, which has reached its limits and which creates serious problems. If the membership expectation disappears, Turkey will definitely do something about it and try to establish other free trade areas in the region. Privileged partnership means that Turkey must adopt the acquis without the right of being represented in EU institutions. However, no one is capable of explaining why a non-member Turkey would accept the acquis or how it would be able to finance the cost of reaching EU standards. In the event of a privileged partnership, the EU will not ask Turkey to adopt the principles of high levels of democracy and being a state of law; this idea’s partisans in Europe are convinced that Turkey would be amazed by that. Although it is true that this would please some in Turkey, one must not neglect the social demands in Turkey in favor of democratization, as they have reached unprecedented levels. Turkey holds a strategic role in natural gas—between the world’s second largest natural gas market, continental Europe, and the substantial gas reserves of the Caspian Basin and the Middle East. Turkey is positioned to play an even bigger role linking gas producers in the Caspian and Middle East to consumers in south-eastern and central Europe. It is developing energy corridors with Russia (Blue Stream I and agreed II), cooperation with Russia’s South Stream, it is participating to proposed EU’s Nabucco gas pipeline project and a potential Iranian gas transit deal. Turkey also imports liquefied natural gas (LNG) from Algeria and Nigeria to its only regasification plant at Marmara Ereglisi. LNG imports have continued to rise as Turkey seeks to diversify its sources of gas imports. Turkey is also taking steps to increase regasification capacity at two of its ports. 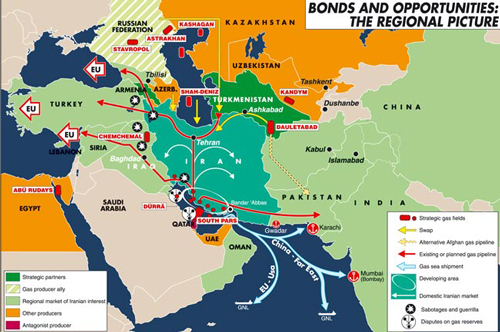 The EU’s new “southern corridor” has been dubbed a version of U.S. “Silk Road Strategy” aimed to block Russia from gas fields around Caspian Sea and its connection to Iran (More in my article “Is GUUAM dead?). The South Pars natural gas field brings a new element to change original U.S. plan as it is a sign of a long-term energy alliance between Moscow and Tehran and with active participation of the EU. Turkey and Armenia may be join the project as transit countries. Naturally, this leaves Washington very few chances to lobby its energy projects in the region aimed at using Azerbaijan and Georgia as the so-called ‘Caucasus communication corridor’. In my conclusion during next few years Turkey will come an energy hub through further development of Blue Stream pipeline from Russia and implementation of South Stream, possible implementation of Nabucco and planned import of gas from Iraq and Iran. So in energy game Turkey will have some aces; if not membership EU must offer very attractive “third way” solution for Turkey. During last bilateral (Germany/Turkey) talks, Mrs. Merkel detailed her view that Turkey be offered a “privileged partnership”, which Turkey has initially rejected. From my viewpoint that may be unwise as the alternative would be continuing a negotiation process without any guarantees of success. The EU’s fear is that if Turkey does not get membership Ankara would look for other partners on energy and security, perhaps getting closer to the China-Russia-Iran axis. So Germany proposes implementing a “privileged partnership” to Turkey instead of full membership in order to allow Turkey into the EU economically but not politically. This proposal is perhaps reasonable for them and from my viewpoint rational also to Turkey. From my point of view Serbia should think if joining to EU is worth of time, money and bureaucracy it demands. Visa arrangements, free trade and some EU programs are possible also for non-members. However I think that at this moment it would be good idea to continue EU process but not because of fulfilling EU needs. The motivation should be the needs of the beneficiaries aka Serbs not EU elite in Brussels. Also from my point of view Serbia should not put all eggs in the same basket; economical cooperation with Russia and other BRIC countries can create real development on the ground instead slow development on the EU’s negotiation tables. From my point of view “privileged partnership” could preindicate a possible search of “third way” between EU member- and non-membership. The model – when first created – could be copied also with some other countries which now are in enlargement process or included in Eastern Partnership program, which aims to promote economic and political stability in the countries. It includes free trade agreements, visa waivers, financial aid and economic integration with the EU. In return, the eastern neighbors are expected to step up progress toward economic modernization, democracy, the rule of law and human rights. On the bottom line “privileged partnership“ could be a pragmatic model of the future relations between Turkey and the EU, it can be applied also to other neighbourhood countries e.g. via Eastern Partnership Programme and can even be better alternative for all stakeholders than full EU membership. 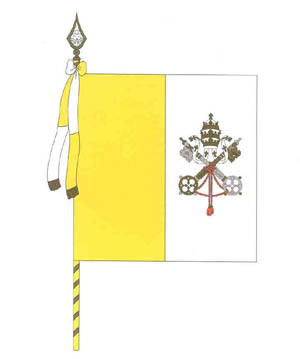 You are currently browsing the Conflicts by Ari Rusila blog archives for April, 2010.